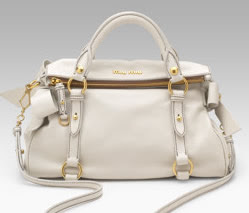 I want to buy a Miu Miu Bow Satchel, do you know if they come in other than of white color? And I would also do with your opinion on which bag will be still around the Bow or the Nappa Satchel? The Miu Miu Bow Satchel comes in off-white and in brown. I've read somewhere that it also comes in black, but I can't find any pictures of it. I like both colors. Depending on what you are looking for, buy the brown for more of a casual look and something that you will be able to wear forever. The white one is perfect at the moment, since white is all the rage, but you might have to set it aside a few seasons down the road, whenever white bags fall out of style. There are different Nappa Satchels from Miu Miu right now, so I am not sure which one you are referring to... in case it's this one, the Nappa Patch Satchel, I don't really like it. I would say go with the Bow. If, instead, it's this one... it's a close call. I like this one a lot, but the style is very different from the Bow. The Bow is a more flexible bag, you could wear it with a nice dress or with jeans. 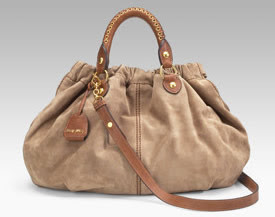 This Nappa is very casual, so you wouldn't be able to pull it off with as many styles as with the Bow. I would say the Bow is definitely the winner. The one on the top is my favorite. 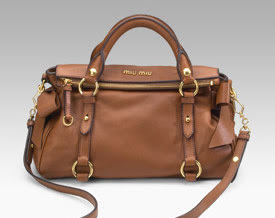 Miu mIu has such great bags! 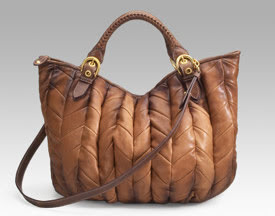 i really like the brown color replica miu miu bow bag most.it's so gorgeous.